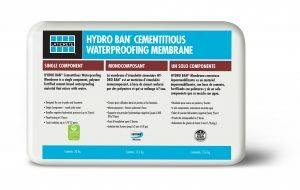 March 6, 2019, Bethany, Conn. — LATICRETE, a leading manufacturer of globally proven construction solutions for the building industry, has launched HYDRO BANⓇ Cementitious Waterproofing Membrane, a single-component, polymer-fortified cement-based waterproofing material that requires only water for mixing, resulting in a faster preparation process. Designed to perform under both negative and positive hydrostatic pressure up to two bars (29 pounds per square inch), HYDRO BAN Cementitious Waterproofing Membrane is ideal for use in swimming pools and aids in avoiding costly repairs from failure. This product can also be used to waterproof spas, water features, balconies or terraces over unoccupied space and all common building substrates that require protection from water exposure. HYDRO BAN Cementitious Waterproofing Membrane was formulated to be GREENGUARD certified and LEED compliant for sustainable building, equipped with anti-microbial technology and is solvent-free and non-flammable. In addition to exceeding ANSI A118.10 Waterproofing and ANSI A118.12 Crack Isolation (with mesh/fabric up to 0.125 inch (3 millimeters)) standards, this product achieved an “Extra Heavy Service” rating per TCNA performance levels (RE: ASTM C627 Robinson Floor Test) to support even the heaviest materials.